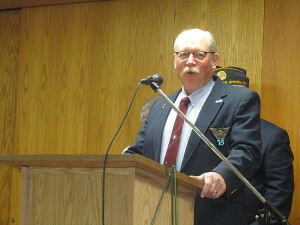 The threat of rain forced Memorial Day services to be held inside the Cedar Springs American Legion Glen Hill Post this year instead of at area cemeteries. “The flags are made of wool and are hard to get dry,” explained Commander Bill Gregones. 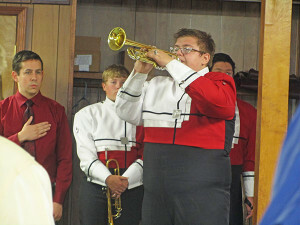 The Cedar Springs Marching Red Hawks were in attendance, and this year’s speaker was Nelson Township Supervisor and longtime resident Colonel Tom Noreen. “Standing with the Marching Red Hawks (band) 45 years ago, as a tuba player, at a similar Memorial Day ceremony, little did I realize I would be speaking at it in the future,” he said. Noreen also didn’t imagine at that time that he would serve 26 years in the Army. “Scripture tells us that there is no greater love than a man laying down his life for his friends,” Noreen told the crowd. “The men and women we honor and remember today have proven that they are not just friends to us Americans, but they are friends to men and women around the world. 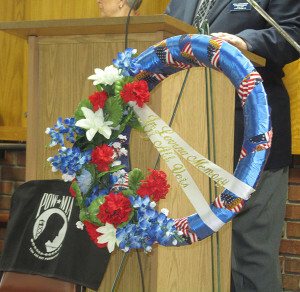 Services were scheduled all across the area, including Algoma, Sand Lake, Pierson, and Howard City.